The American−Darling® 5-1/4” B−84−B−5 fire hydrant, by AMERICAN Flow Control, is also available with the optional AMERICAN Earthquake (EQ) Joint System® base – the only one of its kind. The EQ base allows the inlet pipe to deflect at an angle and move in and out of the hydrant inlet. This unique inlet can compensate for dynamic underground conditions caused by an earthquake. 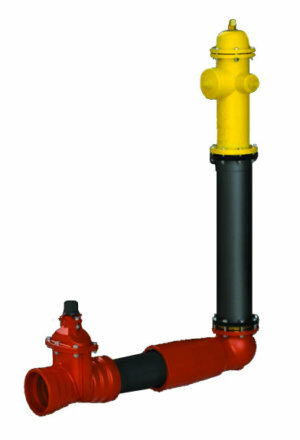 To provide additional deflection, this revolutionary hydrant lead works in conjunction with AMERICAN Flow Control’s Series 2500 RW Gate Valve with Flex-Ring® ends and is connected using AMERICAN ductile iron pipe. The hydrant also has an all-bronze drain ring which is securely retained to the hydrant inlet base. Collectively the features of this proprietary system help to maintain water pressure, conserve water and help provide fire protection in the event of an earthquake. The AMERICAN EQ Joint® base allows up to 3-degrees of lateral deflection. The EQ Joint also allows for +/- 2.4-inches of longitudinal expansion or contraction. The AMERICAN Flow Control Series 2500 RW Gate Valve with Flex-Ring ends allows for an additional 5-degrees of deflection at each joint. The AMERICAN EQ Joint hydrant lead is designed to withstand more than 100,000 lbs. of pull-out thrust. The American-Darling B84B Fire Hydrant is provided with a uniquely retained drain ring which helps to prevent the water loss should the upper barrel be separated from the fire hydrant during an earthquake. The AMERICAN EQ Joint has been validated by independent testing conducted at Cornell University to meet the requirements of ISO 16134 as relates to expansion/contraction performance, slip-out resistance and joint deflection angle. Fully complies with ANSI/AWWA C502 and is rated at 250 psig. Certified to NSF/ANSI 61 and NSF/ANSI 372. Upper barrel is furnished with an e-coated primer and polyurethane top-coat. Positive compression drain, which closes the hydrant drain system within 3-turns. Square hydrant rod which allows for use of a short, light-weight disassembly wrench.